Calendar for Spring Rush 2018!! Sitting nicely in the Appalachian Mountains, we here at Ferrum have been able to accomplish quite a lot. While you navigate through the various interfaces of our miraculous website you will get the opportunity to see the awards our chapter has received through hard work, dedication, and perseverance. If you wish to reach out to our chapter feel free to contact us whenever you please. I cordially welcome you to see the inside of the Ferrum College chapter and thank you for taking time to visit our website. Here are a few pictures from this past year's RLC hosted on campus at Ferrum College. We spent the day on multiple fields of education, from leadership to risk management, and then relaxed with glow in the dark dodgeball. The Regional Leadership Conference is designed to develop leadership skills, to help attendees realize that Delta Chi is more than their own chapter/colony, and to provide Delta Chi men within the Region the opportunity to share ideas, achievements and experiences with other Delta Chi chapters, officers, Regents, alumni, advisors and Headquarters staff. "In the time I spent with Delta Chi, I built many different friendships with people I wouldn’t have gotten the chance to if not for Delta Chi. I had to be accountable for myself when it came to being at meetings, events, and doing my job to the best of my ability in my positions. I learned how to better myself academically and as a person. 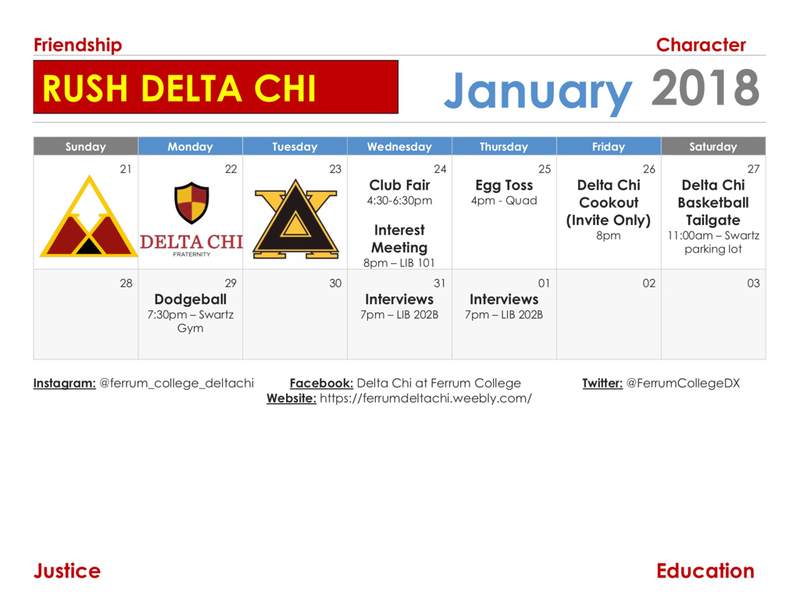 So what I’ve really taken away from Delta Chi was being able to better myself, not to be afraid to take on more challenges in life, and everlasting friendships." "Delta Chi has helped me grow by allowing me to assume a leadership role where I have responsibilities, enhance my communication skills, and execute strategies/plans to improve brother safety." 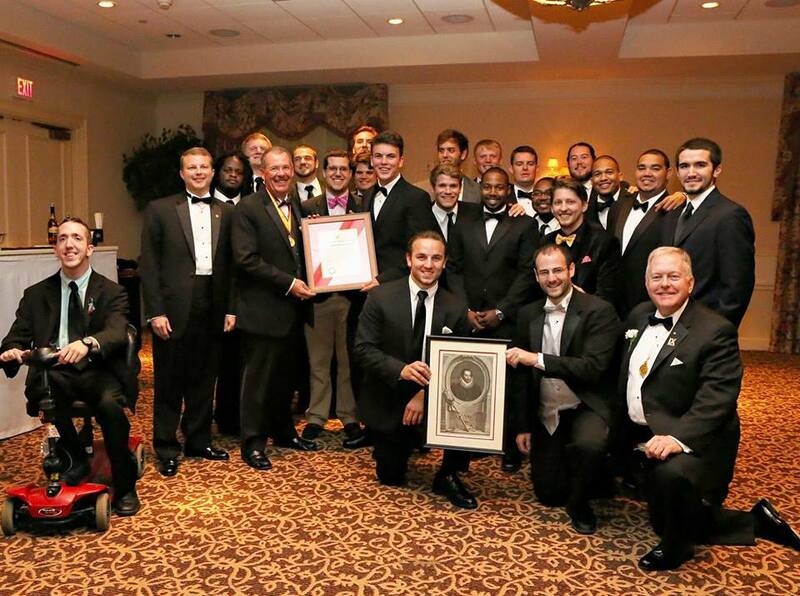 "The Delta Chi Chapter brings a lot to the table for Ferrum College and the community with community service, philanthropy, and social events. This also connects Ferrum to other chapters in the US and Canada. It not only benefits its members but the students as a whole." "I became a Delta Chi brother because of the family that I gained from joining such an amazing close knit group. I know that no matter what happens one of my brothers is always my first to call, if it's to hang out or for help they will always be there for me." If you'd like to make a contribution to the Jimmy V Foundation to help further cancer research, you can click on the button below. No contribution is too small and we greatly appreciate your help to wipe out cancer.